No, not really mine - I've been swimming for more years than I'd care to remember - Charlie's. That's just the label for the photo. I'm not really into all that twee 'this is me speaking through the medium of daddy' stuff. Nevertheless, today was almost as momentous as his first words will be. There's a world of difference between his little blue bath and a swimming pool, but now he's had his jabs we've been planning to introduce him to the water for a while. Of course, Charlie's been to the PRSA (Princess Royal Sports Arena) many times before; Sarah swam regularly right into late pregnancy. It was one of the few forms of exercise that she was capable of in the latter months, and she was swimming just three days before Charlie's birth. So having procured waterproof nappies and a pair of little trunks, we decided - after school today - to take the plunge, as it were. 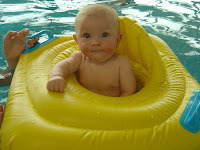 Anything could have happened, from screams of agony to ecstasy, but instead the little chap seemed quite contented floating round the pool in his little yellow floating seat and staring, wide-eyed, at what everyone was doing. Sally was on hand, as ever; Sarah did a few lengths and I had a long soak in the jacuzzi talking to a Year 8 boy from school about the chaos wrought today by the departing sixth-form. (It was their final day before exams.) So a day that started being ambushed at the school gates by a bunch of pirates wielding water pistols ended on a watery note as well. But it was all good natured mischief, and my sixth-form group presented me with gifts entirely appropriate to my interests: a philosophy book, a pen (for my career as a writer, they informed me) and a hip-flask for when things get too much looking after Charlie!